Shenzhen, China – China has suspended He Jiankui – the scientist who claims to have produced the world’s first gene-edited babies. He now looks set to face punishment after publicly revealing research many in the scientific community condemned as irresponsible. His work was “extremely abominable in nature”, Xi Nanping, vice minister of the Ministry of Science and Technology, told state news agency Xinhua late on Thursday. Xi said genetically engineering the DNA of twin girls so they would not develop HIV, breached scientific ethics, adding that gene-editing of human embryos for reproduction purposes was “explicitly banned” in China. He admitted at a gene-editing conference in Hong Kong on Wednesday that he had already initiated another pregnancy, although it was too soon to tell if it would go to full term. A source confirmed to Al Jazeera that He had returned to Shenzhen, although repeated calls to his mobile went unanswered and several messages sent to the phone were read with no response. David Cyranoski of the journal Nature posted on social media that He was in the southern city and ready to “cooperate fully with all inquiries” about his work. The scientist is likely to face a barrage of questions from institutions in Shenzhen, as well as from the Ministry of Science and Technology. China’s National Health Commission said He’s activities would be investigated and any wrongdoing “resolutely dealt with”, according to Xinhua. It is uncertain what punishment He may face since the law in China is vague on enforcement, according to Qiu Renzong, professor emeritus of the Institute of Philosophy and director of the Centre for Applied Ethics at the Chinese Academy of Social Sciences. His research has sent shockwaves through the international scientific community, with many raising concerns over the lack of verified data and the risks of exposing healthy embryos to gene-editing. Scientists have long worried about the implications for humanity of such genetic engineering. R Alta Charo, a professor of law and bioethics at the University of Wisconsin, said if He had done the trial in the United States it “would have been in violation of public law” and involve “penalties [that] are both civil and criminal”. Approvals are needed through the Food and Drug Administration for human cells and therapy studies where cells are brought to gestation. Qiu noted in Hunan province in 2012, three researchers were arrested and then sacked along with three officials who approved trials of vitamin A-enriched genetically modified rice on schoolchildren without their consent. He said in a video released on Sunday – the same day the world learned of the births – that he used the CRISPR-cas9 tool for editing the embryos in order to remove the possibility that the babies would get HIV from their father, who is infected with the virus. Anthropologist Eben Kirksey remarked that CRISPR has become a magic word related to HIV because of the promise that “you only need to take the treatment once”. But, he added, there were many other promising therapies for treating HIV, and he didn’t think many in the HIV research community were “putting a lot of hope” in genetic editing. He gave a partial apology in front of a packed auditorium at the Second International Summit on Human Genome Editing in Hong Kong. The contrition, however, seemed to be more for the information about the births coming out before his research had been vetted by the scientific community, rather than for having carried it out. The scientist told delegates he was “proud of” his work, adding that if the same situation occurred and it was his child he would “try it first”. Most other researchers believed it was far too early to progress to that point given the vast ethical questions that arise from having “edited” – like Lulu and Nana, the names He gave the twin baby girls – and “non-edited” humans living side by side. Across the border in Shenzhen, institutions are distancing themselves from He. Shenzhen’s Health and Family Planning Commission has directed the city’s medical expert committee to investigate He’s activities. Southern University of Science and Technology, where He is an associate professor and is said to have conducted the research without the full knowledge of the university, has sealed off his lab and suspended him pending an investigation. The website on genome research related to He’s work now appears to be inaccessible. When Al Jazeera visited the researcher’s lab, situated on a sprawling campus in a hub of universities in the northern part of Shenzhen, security officers refused entry, complaining about media trying to visit the site. Communications department officials at the school did not respond to requests to discuss the investigation into He’s research activities. At the main gate, a police van was parked across the road, its blue and red lights flashing. Shenzhen Harmonicare Women and Children’s Hospital, where the fertilisation allegedly took place, now denies involvement in He’s work and has said it believes a signature on papers approving the experiment were falsified. Attempts to reach officials at the hospital for further explanation were not successful. A project claiming to have produced the world’s first gene-edited babies has been stopped by the Chinese government, which is declaring the work of scientist He Jiankui as being both unlawful and unethical, according to the Associated Press. The world learned of He’s experiment earlier this week, though we’re still waiting to see outside scientific confirmation of his assertions. 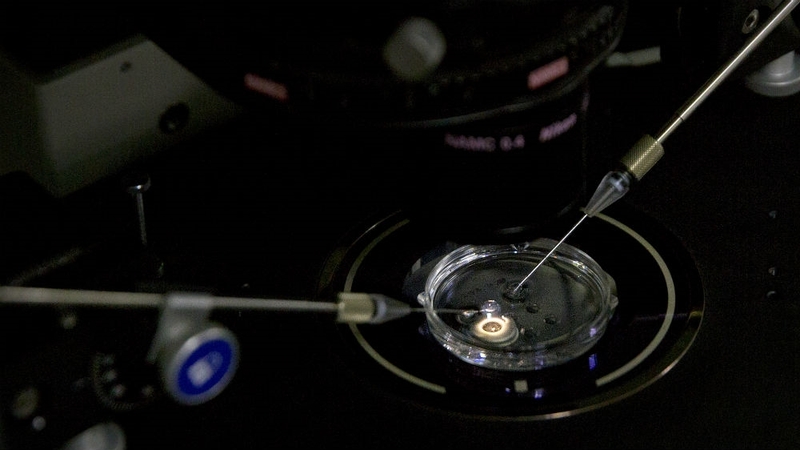 In Hong Kong yesterday, the scientist claimed that he used the CRISPR/cas9 gene-editing tool to modify human embryos, but he made no apologies, saying he was “proud” of the work. The resulting twins, born earlier this month to an unknown couple, are now supposedly immune to HIV. This news was greeted with almost universal condemnation, with most mainstream scientists and ethicists complaining that He violated established scientific and ethics standards, among other complaints. He is being accused of unduly experimenting on humans with an unproven and potentially unsafe technology. On Tuesday, China ordered a “thorough investigation” into the project, but as the Associated Press is reporting today, the government has now taken the added step of shutting down the work until further notice. Speaking to CCTV state television, China’s vice minister of science and technology, Xu Nanping, said the government is strongly opposed to the project. Xu said the experiment “crossed the line of morality and ethics adhered to by the academic community and was shocking and unacceptable,” as reported by AP. No further details were given, nor did the minister explain what might happen to He and his associates in the days and weeks ahead. China’s response to this incident could set an important precedent for a country accused of being the Wild West of biomedical research. No doubt, China has been at the forefront of gene-editing research for a few years now. Scientists there created the world’s first gene-edited human embryo and the first cloned monkeys, as two examples. Critics have complained that these achievements are the product of China’s lax regulatory structure, as compared to the situation in the U.S. or Europe. Those accusations aside, He’s project appears to be the work of an unsupervised lab that took great pains to avoid proper channels, such as failing to file the clinical trial to the country’s registry until early November, which was around the same time the twin girls were born. Furthermore, Chinese scientists have rushed to condemn He’s work. In a joint statement published earlier this week, the Genetics Society of China and the Chinese Society for Stem Cell Research said they “strongly condemn” the project for its “extreme irresponsibility, both scientifically and ethically.” And as VOA reports, over 300 scientists, both from China and abroad, have signed a petition questioning the necessity of the work. This incident is certainly a teachable moment—though hopefully not at the expense of these twin girls, whose future health remains unknown.